Modern landfill sites are simply nothing akin to a site of the past. Modern landfill management is more akin to competitive industrial business than a simple unskilled low tech industry. Modern landfill strategy has three basic foundations. Achieving high waste compaction densities, pivotal management in the overall running of a modern landfill, and obtaining the best and most appropriate equipment to accomplish the task. High compaction density is fundamental to the whole concept of what is achievable and desirable both economically and environmentally. Good compaction provides a stable and safe continuous working platform and with sound management, overall is relatively achievable at all levels of infill. 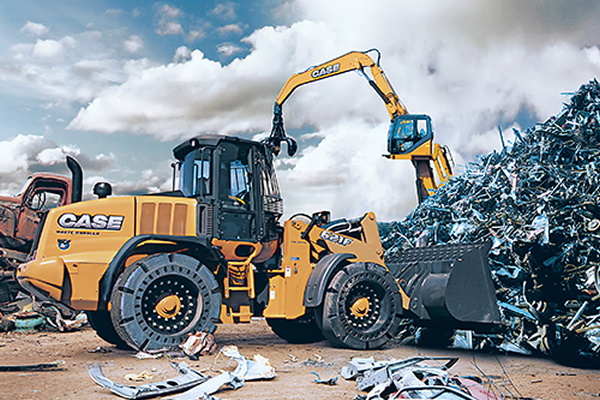 Waste becomes compacted by the weight and motion of the passing of the compacting vehicle. It presses out air pockets and shreds materials binding them together with other waste. Good quality waste handling machines are available to buy or hire from Hanlon Case, the leading provider of construction and recycling machines in the UK. Thin layers of waste at any one time achieve a better level of compaction, with two passes over it, the second in exactly the same tracks to ensure good shredding and binding. One wheel width to one side and repeat the process, should mean the new layer is covered in four machine passes. Keeping the layers thin also causes les wear and tear on the vehicle. Large areas of working face may look difficult to track where compaction starts and finishes, but such is the importance of good compaction, grid patterns are adhered to cover all section equally. Modern machinery can be fitted with GPS technology which can ensure both area and depth of compaction can be perfectly achieved. The necessity of pushing all air pockets out is to ensure that there is maximum stability in the build-up, preventing internal falls which could affect the finished profile. The plant equipment requirements for day to day landfill working are considerable, but the vehicles normally included are landfill compactors, tracked and wheeled tractors and tracked and wheeled loaders. The landfill presents a long term, hard and demanding working environment for these vehicles and some suppliers can produce suitably modified machines, indeed many now have specialised waste handling specifications. Track-type loaders are the versatile vehicle most commonly found on landfill sites, their strength, versatility, allow them a variety of possible roles in virtually all sizes of operations. Next PostWhat Are Driving Offence Codes?